How did you become involved with the Indian Institute for Human Settlements (IIHS)? Two and a half years ago, people like Shirish Patel [HDFC], Deepak Parekh [HDFC Bank] and Nandan Nilekani [Infosys] got together to discuss setting up something like the IIHS. They asked me to be involved, but at that time I was with the RBI, so I couldn’t be a formal member of the board. Yes. For a long period, from 1974 to 1988, I was interested in nothing but cities — urban economics essentially. My Ph.D. thesis was to do with urbanisation and development; and then I participated in a large project for the World Bank from 1976-1980 — the City Study. This was the most comprehensive study done on a city in a developing country, using Bogota, Colombia, as an example. 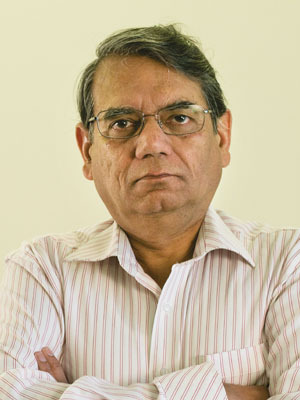 I then came to the Indian Planning Commission in 1980 as a senior consultant and for three years I worked on housing and urban development issues. At that time the current PM was member secretary of the Planning Commission and he helped me set up four task forces on urban development. What is the need for an institution like the IIHS? For the next 30 years there is going to be a great re-organisation in this country. A cursory look at our cities suggests there is a huge need for experts in planning cities. We [at IIHS] also felt that we need an institution which does a new kind of degree, so we are developing the Bachelors of Urban Practice and Masters of Urban Practice. For a bachelor’s it’s four years and for a master’s it’s two years. s the expectation that IIHS will solve the issues of urban planning in India? We are not solving the current specific problems related to urban planning. What we want are better educated people. It’s just like the government a long time ago started National Institute of Design and it had a huge effect on design in India, similarly the IITs had a great effect on the supply of technology in the country. Now you have a huge stock of highly educated managers and technologists. These schools have really made a difference to the country in their respective fields. Right now, 20 percent of the country is urbanised. In the next 50 years that’s going to jump to 50-60 percent. This is actually a very good time to start. In five years, you’re going to start getting highly trained individuals in urban design. How is IIHS distinctive from other private universities? One feature is that we’re clear we must be an inclusive university — right from the beginning. We will have fees that are appropriate but also a huge fund for scholarships. We will be very different from ISB [Indian School of Business], we want to be independent and autonomous. We want to have a research program, want to do advisory services, and the faculty will also be involved in practice with governments, development authorities. There are a great degree of PPPs [public private partnerships] coming up in development — so that’s another distinctive feature. We’re in consultation with MIT, we want to have open courses like they do, and we want to put all our courses online. Is it too late for our metros? It’s never too late. If you read old novels about London, those old cities were often described as “net consumers of men”. The sanitation was so bad and technology was not available at that time, it was just the beginning of the industrial revolution. There was lots of rural to urban migration and people lived in extremely unhygienic circumstances — they died off within four-five years. And now see how those European cities look today! Besides, how can you live in India and not be an optimist?! Wonderful effort this. I like the last sentence ..... We need to be optimistic. Are We Making The Same Investment Mistakes?